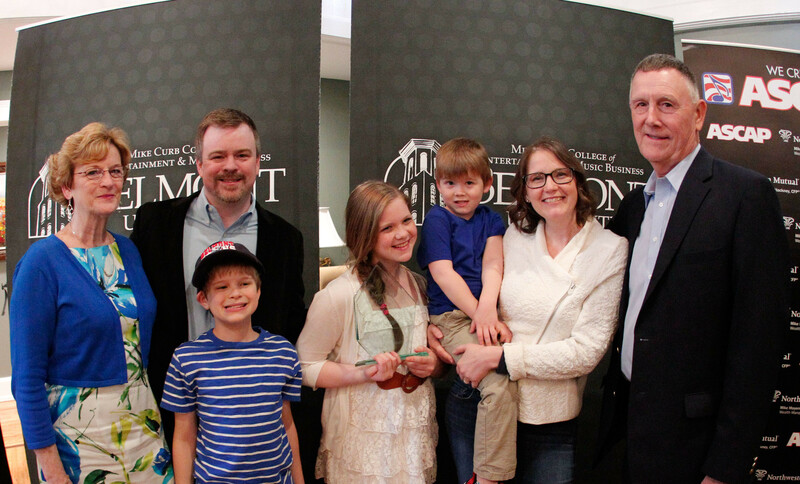 Belmont University’s Mike Curb College of Entertainment and Music Business, alongside industry partner ASCAP, honored alumnus Ben Vaughn as the sixth recipient of the Music City Milestone Award (MCMA). The MCMA celebrates Belmont’s connection with Music Row while recognizing a Belmont graduate who has achieved truly superlative success in the entertainment and music industries early in their career. Previous Music City Milestone Award recipients include Beka Tischker, Ashley Gorley, Rusty Gaston, LeAnn Phelan and Carla Wallace. “Ben does not like attention put on him… But well-deserved to celebrate his journey and impact on the music industry with his family, friends and peers,” said ASCAP’s Michael Martin. One of Ben Vaughn’s first internships as a Belmont student was with Warner/Chappell Music, and today he stands as executive vice president of the company’s Nashville office. Vaughn’s professional career began early. While still a junior at Belmont, Vaughn joined Big Tractor Music and served as general manager there for six years. Following his time at Big Tractor, Vaughn explored a new side of the industry as vice president/head of A&R with EMI Music Publishing. EMI later promoted Ben to executive vice president/GM, until Sony/ATV acquired EMI’s catalog in 2012. It was then that Jon Platt, president of the North American division of Warner/Chappell, tapped Vaughn to come back to his roots at Warner/Chappell Nashville. “Belmont University gave me the firmest of foundations in music industry education and relationship building in an atmosphere of support during my early years in Nashville. Being recognized by ASCAP and the University means so much to me and my family,” said Vaughn. To honor Vaughn remarks were made by some of his biggest mentors at the MCMA ceremony, including producer and EVP of A&R at Warner Music Scott Hendricks, former Sony Music Nashville Chairman and CEO Gary Overton and Platt.